AMITY JEE 2019: The Amity University will conduct the Amity Joint Entrance Examination (Amity JEE) for those candidates who want take admission in the B Tech program which is offered by the university. It is a computer-based test (CBT) which is conducted by the Pearson VUE. Interested candidate requires to fill the application form. All the candidates are able to get the complete information regarding the AMITY JEE 2019. Here we are mentioning the important dates regarding the Amity JEE. The dates given here is expected. We will soon update you regarding the Amity JEE Dates. The dates are as follows. Those candidates who are appearing for the entrance exam is must sure that they are full filling the eligibility criteria. So we are mentioning here the detailed Amity JEE 2019 Eligibility criteria for different courses in the BTech. The eligibility criteria are given below. To know how to fill the application form of the Amity JEE we are giving here the details. Candidates can apply for it in both the mode i.e. through the online and the offline mode. The steps for the Amity JEE Application Form for the online mode are as follows. A tab open name as applies Click on it. All the candidates need to register on the portal and then required to fill the rest of the details. After filling the form upload the image of the dimension 3.5* 4.5 in JPG, JPEG, PNG, BMP & GIF format. After that student needs to make payment. Firstly candidate required to click on the “Apply Now 2019” link from the official portal. Then a tab appears for the Download Application Form For Offline submission. Fill each detail correctly by affix the recent passport size color photograph and submit along with the photocopy of class 10th mark sheet. Candidate can also buy the application form. There is a tab of the Buy application pack from Amity Information Centers / Campuses. Candidates can buy the application pack from the Informatic Centers/campuses in Noida, Greater Noida, Lucknow, Jaipur, Gurgaon (Manesar), Gwalior, Kolkata, Mumbai, Raipur & Ranchi. Paste the recent passport size color photograph and submit along with the photocopy of class X marks sheet at the respective campuses. For the entire category, the Amity JEE Form Fees is common i.e. Rs 1100 whether the candidate gives the exam through the online or the offline mode. For those who are paying the fee through the online mode can pay it through the credit/ debit card and those who prefer to fill the form through the offline mode can fill it via a DD in the favor of the ‘Amity Form’ payable at New Delhi. Before going to the exam students need to go through the Amity JEE 2019 Syllabus. The syllabus helps the candidate to know about the subject and the important topics which were come in the exam. The syllabus of the is given below under the table. 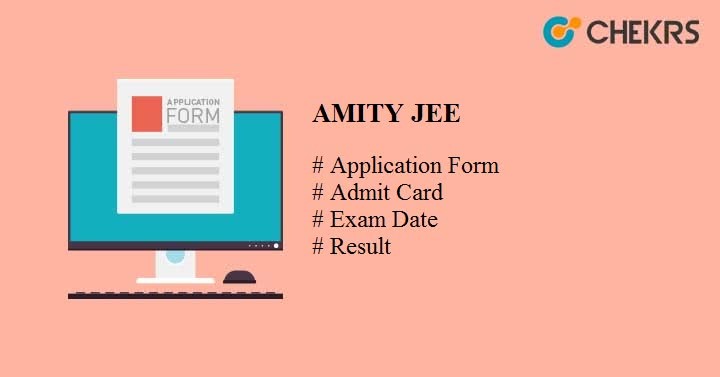 The admit card of the Amity JEE 2019 will be available on the official website of the university. Mostly the university releases the Amity JEE Admit Card 1 week before the exam is started. The candidate also needs to carry one govt. ID proof such as Aadhaar card, voter ID card, driving license along with the Hall Ticket. Students can see their Amity JEE 2019 Result from the official website of the university in the month of the May 2019. Candidates required to enter the application number, DOB, password etc. after seeing the result take print out of it for the future use. Those candidates who qualify the exam are eligible for the Amity JEE Counselling. For the counseling, candidates are informed through the E-Mail. On the day of the counseling candidate required to bring the all the relevant document, marks sheet of the qualifying exam, admit card & passport size photograph. The details given here are as per the official notification if there is any query please mention it through the comment box given below. We will soon give the response of your query.